Absolutely loving this book. Not quite finished but certainly one of the best ever. One of my top 10 for last 5 years of reading, and or listening! Easily my favorite read this year and one of my favorite all time. Sometimes books are better as an audiobook, sometimes not. This definitely was far better in every way with one exception. Nearly every, city, town, mountain or native name used was mispronounced. Inspiring story that brought tears to my eyes! Great for young adult readers to help the appreciate how difficult life can be and learn how to have the fortitude to overcome. Terrific narration! Excellent book. It hit the nail on the head describing the rowing world. Despite being a Cal alumni, I enjoyed the book a lot. There are lots of things in the book that reminded me of my rowing days. Nice story. Many facts though at times. Great narrator. Loved this book so much. I knew nothing about the sport of rowing. So amazing! Truly inspirational work. Absolutely worth your every second. I loved how the author wove together the narratives of the Great Depression, the rise of Nazi Power and the effect they both had on the lives of ordinary people trying to achieve extrardinary things. 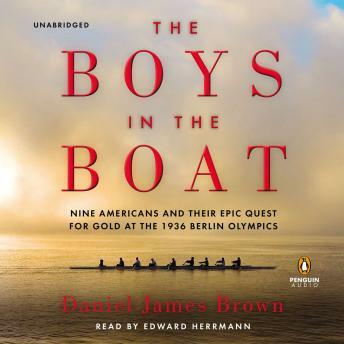 The making of the 1936 Olympic Rowing team was the perfect backdrop for that story. The book is just incredible and no one comes close as a reader to Edward Herrmann(rip). An absolute must ! !